Flexible Printed Circuit Board is a kind of Flexible, folding degrees higher polyester film or polyimide substrate after a series of production processes and made of a kind of components and circuits can be put, and can finish electrical functions with high reliability, good flexibility and light weight of the Printed Circuit Board, also can call it Flexible plate or soft Board, its English name is a Flexible Printed Circuit Board, FPCB for short. In the early days, it was mainly used in aerospace and military equipment, but now it is widely used in consumer electronic equipment. Compared with the traditional printed circuit board, flexible printed circuit board can be summarized as the following characteristics: small body, light weight and thin thickness; Flexible and flexible; High reliability; The cost is low; Excellent dielectric and heat resistance. Due to its advantages of being light, thin and flexible, the production equipment and equipment can be small and light, which is also an inevitable trend of the future development of electronic equipment and products. Therefore, the development prospect of flexible board is better than that of traditional printed circuit board. It is similar to the traditional printed circuit board, and electrical interconnection is mainly realized through three types of conducting holes: through-hole, blind hole and buried hole. Among them, figure 1 shows the interconnection mode of flexible printed circuit board. At present, electroplating technology is the most common electrical interconnection technology in PCB industry. Due to high dispersion of plating solution and good average plating ability, this technology has been paid more and more attention in this industry. The classification of flexible PCB on the base of the board layer is the same as that of the traditional rigid printed circuit board, mainly including single-side Flex-PCB, double-side Flex-PCB, and multi-layer Flex-PCB. The surface of single-side Flex-PCB has only one layer of conductive pattern obtained through chemical etching, while the double-side Flex-PCB has a layer of conductive pattern on both upper and lower sides, and a layer of metal is covered on the insulating material pattern by depositing copper to form conductive path. 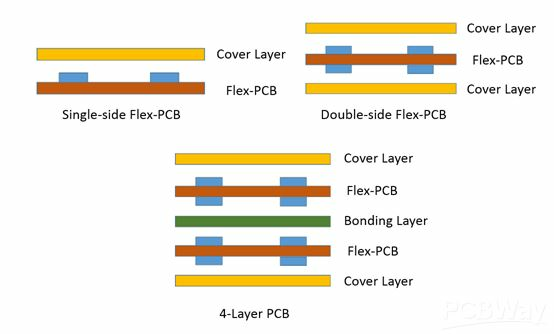 Multilayer Flex-PCB is formed mainly through lamination of many single-side Flex-PCBs or double-side Flex-PCBs, and then through Plated Through Hole (PTH) to cover a layer of metal between different layers to form a conductive channel. The classification of flexible circuit boards is shown in figure 2. The manufacturing process of flexible printed circuit board is basically the same as that of traditional circuit board, which is mainly divided into addition method and subtraction method. Reduction method is usually refers to the first through the electroplating method or photochemical method to transfer circuit graphics to plate copper-clad copper surface, and then using chemical etching method will be useless part etched away, leaving the circuit graphics, mainly divides into the photochemical etching process, screen printing, etching process, graphics, etching process, the whole plate electroplating electroplating masking method, ultra-thin copper foil etching process five process quickly. Due to the limitation of line width and line spacing in the reduction method, the fine lines produced by the method cannot meet the development demand of modern electronic equipment. The addition method is totally different from the subtraction method. It is mainly a method to selectively deposit conductive metal on the surface of insulating base material to form conductive pattern. The process can be divided into five categories: semi-additive process, total addition, NT, photoforming and multiple routing. 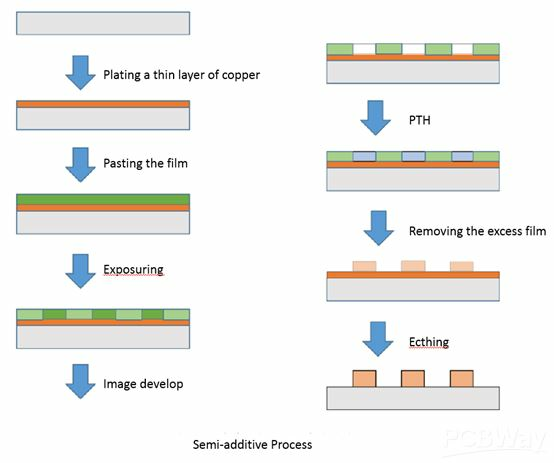 Among them, the semi-additive process is usually a method that combines electroplating addition with rapid etching, and its technological process is shown in figure 3. Semi-additive process: first, an insulating laminate is deposited on its surface with a metal copper layer of about 1-3m thickness using chemical copper precipitation process as a seed layer, and then get the area of fine line through pasting film, exposuring and image developing. Then selecting the pattern electroplating to deposit the metal to thicken (here, Cu, Ni, Pb and other metals can be deposited), and finally remove the dry film to quickly etch the copper layer in the non-line area, then the pattern line can be obtained. This method can overcome some troubles such as the instability of product line, unable to make thick copper circuit and other defects.